There’s a great show on TV these days called “the middle”. It reminds me of my own family quite often. If you’ve seen the show and know the youngest character named “Brick”, you should know that my youngest son ALSO repeats himself under his breath. Before the first time we saw the middle, we just figured it was a quirky thing all his own. If you’ve got 22 minutes, head to abc, Hulu, or your favorite online viewing site, grab a drink, a chair, and enjoy. Enjoy Brick’s struggle to socialize. Enjoy Axel’s attempts to get girls in the pool. And enjoy Reverend Tim Tom’s ability to set anything to music. Hilarious, and as youth pastors go…nothing at all like me. At least I hope not. After returning from a week and a half vacation on the Gulf of Mexico (the non-oily part), our yard needed some TLC. So the Hotness and I teamed up. She grabbed the mower and I grabbed the gas powered weed whacker/trimmer. She started the mower up and went merrily on her way. I grabbed the weed whacker, flipped the switch to “cold start”, pushed the rubber bubble to prime the engine, and yanked the cord. And yanked. Yank. Yank. Yank. Yank. Yank. (“Man, it’s hot out here.”) Yank. Yank. Yank. Yank. (“Arrggghhhh.”) Yank. Yank. Yank. What in the world? I’ve had a slight problem starting up my trimmer in the past, but never like this. This was absurb. I thought, “Okay, I’ll take a break and get some plyers for when I need to change the line on the trimmer later. That’ll give the engine a chance to reconsider its obstinance.” So, I went inside, got the plyers, came back outside, stared down that trimmer, and tried again. Yank. Yank. Yank. Yank. Yank. Yank. (“Man, is this getting frustrating.”) Yank. Yank. Yank. (“My arm hurts.”) Yank. Yank. Yank. Okay, this was getting ridiculous. Now, I’m getting ticked. Why wouldn’t this thing work? My wife is already halfway done the front yard, and I’m still standing here looking at a trimmer that won’t–for the love of everything good and decent–start up and work! I figured I’d take a break again. I don’t recall what I did for those few minutes, but it should have included praying. It didn’t. So after a few minutes, I came back out to the hell-spawned machine, stared it down trying to intimidate it into submission, picked it up and again yanked, yanked, yanked, yanked, yanked on the start cord. (“Trimmer, you are like 30 seconds away from being a permanent part of that tree trunk over there. So, if you value your place in my life and in my shed, I’d suggest that you do something besides sputter!”) Yank.Yank.Yank.Yank.Yank.Yank.Yank.Yank.Yank. I set it down on the ground, sweat pouring from my forehead, my t-shirt dripping. And I hadn’t even actually done anything yet. And that’s when it happened. I looked down at that trimmer and noticed a silver switch with two words on either side of it: “OFF” and “ON”. Guess what I had forgotten to flip? Yep, the kill switch. I could’ve yanked that start cord for the next 4 years and it never would have started as long as the “ON” switch was “OFF”. Truth is all around us, friends. And if you think for a second that I didn’t make an IMMEDIATE connection of that switch to a powerful life principle, you don’t know me too well. How often in our own efforts to do roll up our sleeves, go at something over and over and over and over and over and over and over and over, only to end up in the exact same place we started? How often do we decide that our strength is enough, or that is has to be? How often do we overlook the obvious truth in front of us: that the God who made us has every bit of power and offers us his power in its fullest measure; more than we need to handle the situations we face, whether they are slightly annoying or catastrophic. Where in your life have you been yanking and yanking and yanking on that cord, trying to make a go of it in your own strength? Where in your life are you ignoring the “more than enough” power of God to lift you, guide you, help you, and empower you to overcome that situation? Would you be willing right now to reach down in your heart and mind and flip that switch? Allow the all-sufficient, all-knowing, all-powerful, all-loving God to give you every bit of every resource you need as you live with Him today. Anne Rice, famed “vampire genre” author of several well-known and acclaimed books, recently stated publicly that she “quit Christianity”. Want to read about it? Click here. However, upon closer inspection of her forsaking “Christianity” as her stated religion, she clearly is trying to stay close to Jesus Christ. This presents a problem: it’s impossible. Impossible, and yet quite trendy. And comfortable. And easy. And non-sensical. And unbiblical. And trendy. From what I can gather, the movement known as the “Emerging Church” has based its premise of existence on a similar notion. 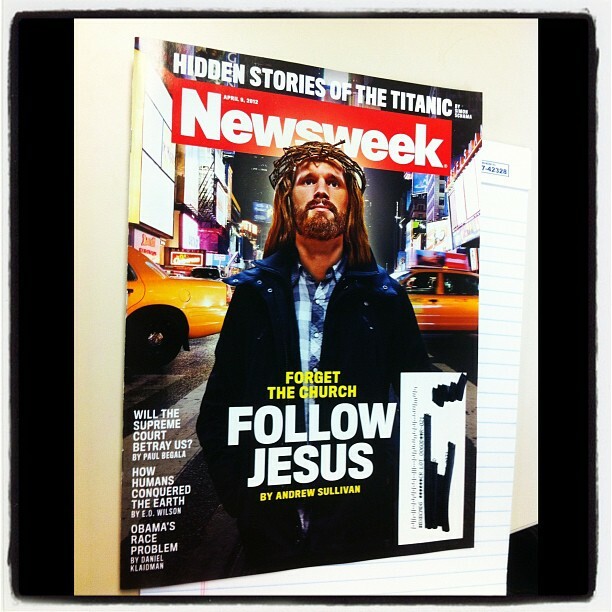 Here’s the idea: Following a decapitated Jesus. There seems to be a subtle dismissal (and sometimes blatant condemning) of the body of Christ as it is as new trends in church leadership bring a new a kind of Christianity. Ironically enough, the word “Church” (ekklesia) is still in their name. Jesus said clearly that He is the “head of the Church” (Eph. 5:23) and that His followers (mathetes) are His body (1 Cor. 12:27). And yet it seems that some people try and marry Jesus’ head without marrying His body. Again, I’ll say it: Impossible. Anne Rice’s #1 reason for leaving Christianity? She has reached the conclusion that the word “Christian” is synonymous/interchangable with words like “anti-gay”, “right-wing conservative”, “bigoted”, “judgmental”, “condescending” and the ever en vogue “hypocritical”. To her, Christians are defined by those people who profess one thing while living something else. So, what should someone do when they find more in the Church to condemn than celebrate? What should someone do who wants to cling to Christ but tell His followers to “take a hike”? What should someone do who has become disenfranchised by the short-fallings of those they’re attached to, by virtue of being under the same “religious” umbrella? What does someone do when they, like Anne Rice, find themselves wanting to follow Jesus, but want to have no part of “organized religion”? Here are my thoughts. 1. Remember your humanity. This one sounds simple, I admit. But if you’ll just remember the frailty of your own skin, bones, attitudes, spirit, and self then you’re a step away from remembering that every other person on the planet has the same frailties. We’re all spiritual beings wrapped in flawed and broken vessels. And inasmuch as we are all imperfect, we need to stop expecting anyone (even “Christians”) to live completely perfect lives. Do some Christians seem to place themselves on some higher pedestal where they look down on others? Sure they do. And so do some Buddhists. And so do some Muslims. And so do some Taoists. And so do some Wiccans. And so do some Hindus. And so do some Atheists. And so do some Gnostics. And so do some Mormons. And so do some Free Masons. Why? Because the one thing we all have in common is that we are all broken humans. Remember that and you’ll find yourself open to grace for others, perhaps as quickly as you receive it for yourself. Our focus on “doing good” is not a bad thing (of course), its just that we’ve put too much emphasis on that being the MAIN criteria for entrance into heaven and eternal salvation. Tisk tisk. #3: Remember grace. This one sounds close to #1, but when a person hears, receives, and is transformed by God’s grace, they MUST live a life from that point on that seeks only to communicate that grace to every other person they come into contact with. Any good Christian (and most non-Christians) can quote John 3:16 to you. You know, the one about how much God loves the world, and how He gave His only Son so that anyone who believes in Him (Jesus) won’t die but will live forever.” However, we need to know just as well the very next verse; that Jesus didn’t come to earth to condemn it, but that through Him the world (that’s us) might be saved. Where in there are we as His followers called to bring the gavel down? We are called to love the Truth, love all people, and to speak truth (Eph. 4:15) with love. Some people are really good at speaking truth but lacking the love part, and some people are so loving that they forget the truth part. Both of those are equally off. We’ve come to this idea today that the greatest kind of love accepts everyone’s beliefs as all true, all valid, all equal. This is actually the most pretentious farce of real love as we can hold and perpetuate. “Tolerance” has seen its crest in popularity and is now engrained in our children. Tolerance says that I can say that there is a God and I’m right because I believe it. And you can say that there is no God and you’re right because you believe it. And neither of us should say anything that might hint at the fact that we’re completely illogical as long as we hold tight to our “tolerance”. Its completely disrespectful in today’s society to convey any sense of absolute. Why? Because absolutes inevitably make someone uncomfortable and God (or Allah or Buddha or the Jolly Green Giant)-forbid that we make anyone uncomfortable. So goodbye Anne Rice, enjoy your walk into the sunset with the head of Jesus tucked under your arm. We, His body, those who love Him, love others, give grace, seek justice, walk humbly, and love mercy will be here if (and when) you get back. *That Newsweek magazine cover was added April 2012, 2 years AFTER this post was originally written. Pretty crazy, huh?